The South Korean government said Thursday that commercial rollout of fifth-generation mobile network services could be delayed to next month, as phone manufacturers and telecom firms are struggling to meet the original March deadline. During a press briefing, the Ministry of Science and ICT acknowledged that 5G network services might not be available to consumers by the end of this month. The ministry had been seeking to begin the commercial service this month after 5G-capable smartphones hit the market. 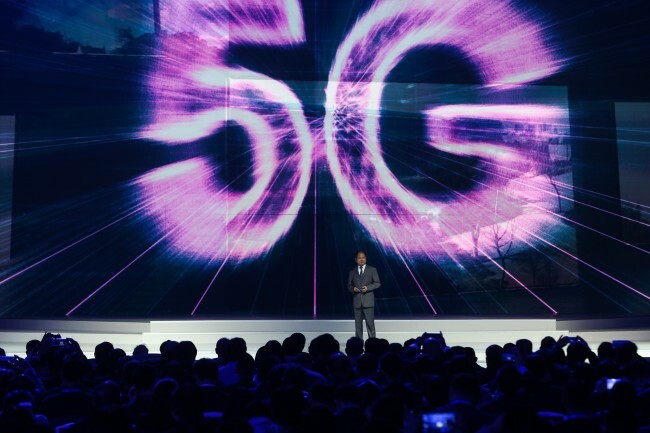 While Samsung Electronics and LG Electronics have showcased their first 5G-powered smartphones, the phone manufacturers have reportedly struggled to meet Korea’s quality standards for the devices by the month’s end. According to industry sources, LG’s V50 ThinkQ would fail the March deadline as the new phone has to wait for the new version of the modem chipset that needs to be provided by Qualcomm. Qualcomm’s new 5G X50 modem is expected to hit the market after April. Samsung Electronics is reported to have its own issue. While the world’s biggest smartphone maker uses its own processors for its 5G smartphones, speculation is rampant the company needs more time to pass trials. “It’s fair to say that the whole 5G rollout timetable was based on when Samsung’s 5G smartphone would hit the market. ... If there is a (delay) within Samsung, the whole launch would consequently (be delayed),” said a source familiar with the information technology industry. Compounding the problem is that even if the phone manufactures were to roll out the products in time for March, the country’s mobile carriers would not be ready to determine how much they would charge for the new service. The announcement came amid mounting pressure on mobile carriers to minimize the price hike of their 5G mobile services. Consumer activists have argued that while the carriers have invested heavily in building 5G networks, the cost could be offset by an increase in the number of subscribers. “Since SKT’s expensive pricing plan was only designed for those using massive data, we recommended that the company work on the issue. We believe it carries the risk of limiting the choice for others planning to use less data,” the ICT Ministry said. The ministry, meanwhile, pledged to achieve “people-oriented” technological development, with the focus on activating the market for hydrogen-powered vehicles, along with the successful commercialization of the 5G network. In specifics, some 74.3 billion won ($65.8 million) will be spent this year to strengthen the data economy, with the aim to build 100 big data centers across the country. For artificial intelligence, the ministry will aim to foster at least 10 innovative achievements through a regulatory sandbox system. The ministry speculated that such new technologies would generate business opportunities and profits worth 560 trillion won by 2030. The ministry will also set aside 1.71 trillion won this year for promising researchers, while supporting students in software development to nurture some 2,600 experts this year. The ministry separately decided to invest some 580 billion won in promoting the space industry this year, accelerating efforts to develop the country’s first homemade space vehicle. Some 178 billion won will be used in creating an advanced rocket engine. The system will be applied to a Korean space vehicle scheduled to be launched in 2021. The ministry plans to invest 312 billion won in developing the next generation of medium-sized satellites for its agricultural and forest business. About 62 billion won will be used to explore the moon by developing technology crucial to the spacecraft. 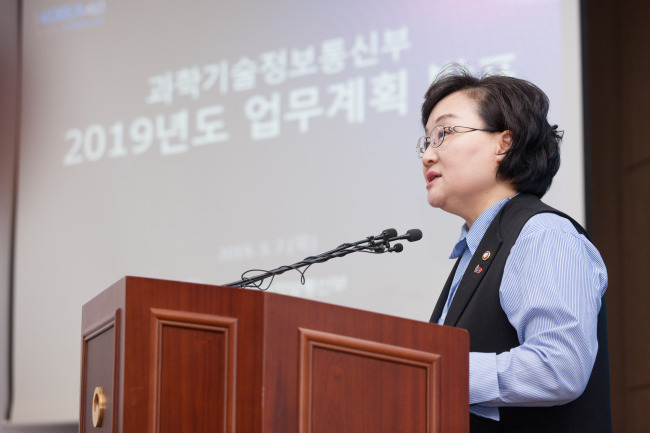 “In order to enhance our capability to develop the space industry and promote relevant sectors, we will do our utmost to implement the plans,” said Moon Mi-ok, who serves as the first vice minister of the Science and ICT Ministry. Those envisioned schemes are parts of the government initiatives designed to promote the country’s space industry. Six strategies were selected after reviewing projects submitted to the ICT Ministry.